What's New at Enchanted Quill Press LLC? Download MoneyBuckets to get started using a tracking system for your money. 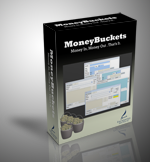 MoneyBuckets uses an envelope system "Buckets" to help you stick to a budget based on your paychecks. Read our quick start guide to get started today. Most applications out there just keep track of your balance. MoneyBuckets with our budget template help you plan where your money is going. Best part it's freeware...right now. This Feed Group is Empty. We're working on a new design, since this one is a little dated. Intervue Digest was about shareware and web sites people find useful and after a face-lift and some creative effort. We plan on making it a great resouce once again. Events and Tournaments for Racquetball. Still under development. Started writing about racquetball in 2002. Articles, blogs, Leagues, and other comments about an Amatuer's Racquetball life. Also have developed some software to help run our Leagues and rank players. If you play racquetball then check us out. Site-Rx "We Help Your Site Get Better." Started in 2012, we help small businesses with their website needs and offer solutions to improve what they already have and integrate new features and services for their customers. ELO Calc Lite Online, Mac, and Windows. Our first complete application for Microsoft Windows using Microsoft Access 2007 is ready for free Download. MoneyBuckets is for tracking your accounts using an envelope system "Buckets" and helping you stick to a budget based on your paychecks. delgado@eqp.com and @joedel on Twitter. Copyright 2010-2013 by Enchanted Quill Press, LLC. Last Updated: 4/7/12.